NYC based trio, Boy Band, first caught our attention two years ago on Soundcloud , and captivated us last year with the release of their debut EP, Begin. 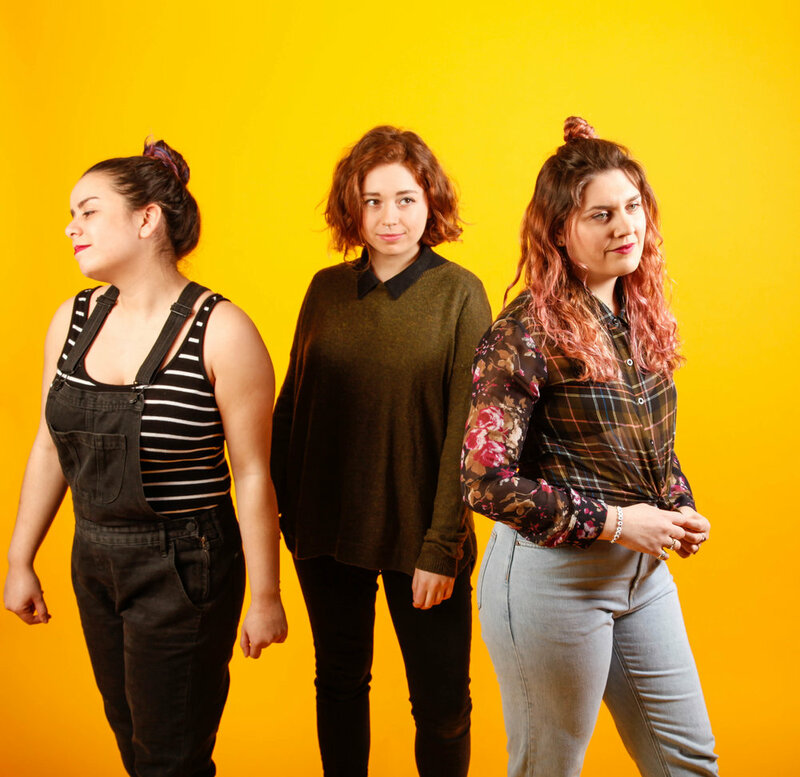 Now, we’re excited to premiere the trio’s latest single, “Still”, a poppy trip down memory lane, a song about your awkward teenage years and learning to love them. Per usual, the vocals of HaleyJane Rose, Ana Dratz, and Jen Fischer tell a story rich with carefully crafted harmonies and infectious melodies. This song is sure to end up on your summer playlists, and it’s a great hint as to what Boy Band has in store, as they are working on their upcoming album. We chatted with the magical beings of Boy Band about how the trio writes songs, blending different musical tastes, and their favorite boy bands. How did Boy Band come to be? Ana Dratz: Haley and Jen used to sing together in high school and Haley and I would sing together in college. After a couple years of Haley mistaking Jen and I for each other (I got called Jen a lot), we finally all met up at our friend’s backyard barbecue and gave everyone a little impromptu cover of KT Tunstall’s “Black Horse and a Cherry Tree”. The rest is history. RC: What inspires you? Any old memories or experiences that continue to inspire you? AD: I’m not much of a lyricist, but boy(band) do I like writing music. I will hum random melodies and go home and figure out an instrumental part for it. Sometimes my mood affects the tone it takes on and that helps bring forth ideas for lyrics. HaleyJane Rose: Songwriting, for me, tends to be processing something that’s already happened that I can reflect through the lyrics. I’m not a heat-of-the-moment kind of writer, I think it’s too hard to make your story into a song when the story is still happening and you’re still in those feelings. Similarly, I love writing other people’s stories or experiences into songs. Jen Fischer: I tend to write about new experiences over old memories. I often use writing music as a tool to help me cope with and process through new situations and experiences. RC: How do you blend your different music tastes? Your voices work well together, but I think what is super cool about your band is that all three of you have different styles and work on your own solo projects as well. HJR: Thank you! I like to think that our differences are what shapes our sound. I think Boy Band is the meeting point of all of our individual music tastes and writing styles, which makes it easy to keep things democratic and interesting. I might pitch a song I wrote to the group, but it doesn’t become a Boy Band song until the girls start arranging and putting their spin on it that way. AD: I think because our voices work well together, we are able to take our different tastes in music and make them sound like the same genre. It all comes down to how we choose to arrange the songs to fit our vocal collective. Some of our songs sound completely different to how they did when they were initially brought to the table. JF: It’s great that we can pull from all of our influences and still create cohesive songs. I think it actually helps to have different influences when we write; we can bounce ideas off each other and make something that sounds more interesting. Can you tell us a little about the story behind “Still”? HJR: “Still” is about celebrating memories. My teenage years were shaped by summers hanging out with my nerdy theatre camp friends, truly from the break of daylight to midnight every day. We were so awkward and, by all accounts, ugly, but we had such carefree fun together - we were the only things in the world that mattered to each other. I romanticize that time, even though a lot of what we did was embarrassing and un-pretty, and I get sad that that’s over. So, the songs about finding that feeling again, remembering it even if you can’t go back to it. RC: How do you decide who takes the lead on songs? Is it mostly who writes the lyrics? HJR: Usually that’s how it works, yeah! With our collaboratively written lyrics it becomes whose voice matches the tone of the story we’re trying to tell. So, I suppose when it’s a project written individually and taken to the group, the one whose story it is usually tells it best. RC: “Still” is a song that you three have played live for a while, how did the recording process change or refine the song? What makes it different recorded versus live? 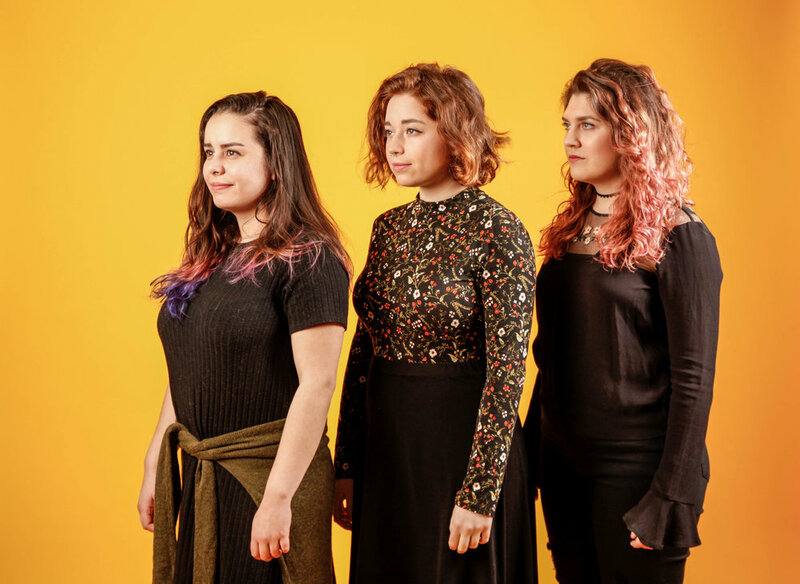 HJR: We love playing our stripped back trio sets, but I feel like the song finally found its home when we got into the studio. I went through waves of how I wanted “Still” to sound, starting with pitching it as a pop tune... then reconsidering when we began playing it out on acoustic guitar... but then our producer, Jack Hoffman, helped us find this sound that I think was there all along - for folk, it feels hyper-pop, but for pop it feels a little retro and rootsy in tone. AD: In the case of “Still”, that’s all Haley. Jen and I just helped build upon that. Even when Haley first presented the song idea to us, she came at it with very poppy references that we allude to in the recording. It’s hard to emulate all of what we had in mind when we play live, but we do our best with the little vocal bursts to bring you some of what our studio version shows. JF: For myself personally it was hard to think about what I wanted the recording to sound like because I was so used to the live version! Because Haley had written most of the song, I deferred to what she thought the recording should be, and I ended up really liking the direction she wanted to go in. “Still” is a little different from what we heard on Begin as it’s got more of a poppy vibe, how have you enjoyed experimenting with your sound? Are you headed in a different direction with new music? Are there any styles or ideas you want to try? HJR: I think genre in music should be treated as “what’s the best way to serve the story and message of this song?” In the case of “Still”, leaning towards pop serves the fun, carefree nostalgia of the lyrics. We’re currently recording our first full length album and some songs lean folk, some country, I’d love to try some more synth-pop and rock... it’s been so fun to find the perfect, unique arrangement for each song in the studio, while still being true to ourselves. AD: Production-wise, “Still” is definitely more pop, but the sentiment and style in which we wrote it is very much the same. Live, they all sound like the folk-pop we advertise ourselves as, but recording gives us a great opportunity to lean into the genre they were inspired by. JF: All three of us have different tastes and influences, so I don’t think we’re necessarily changing our sound or vibe or going in a completely new direction, just experimenting with what we like while keeping the Boy Band feel. HJR: We did a rendition of “I Want It That Way” by the Backstreet Boys the night we played a bill with Lena Hall! It was so fun! Let’s bring that back. The answer, though, is obviously *NSYNC. AD: We definitely need to play around with more from that genre. After all, we are called Boy Band. JF: *NSYNC IS THE SUPERIOR BOY BAND I WILL FIGHT PEOPLE ON THIS. Stream Begin on Spotify here... orrrr buy it on iTunes here. You can also listen to their awesome “Baby One More Time…” cover and all of their other fun songs on their Soundcloud! Don’t miss Boy Band’s “Still” Single Release Show at Rockwood Music Hall on May 18th!